Incident: Lost at sea when his ship was torpedoed. Born at Halifax, NS and attended local schools. Played hockey and baseball. 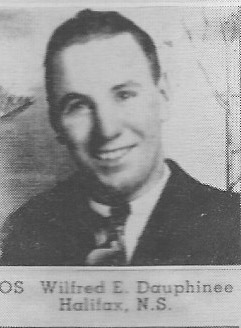 Was employed as a truck driver when he joined in Halifax in Sep 1941. Surv. parents, Mr. Mrs. Eldon Dauphinee of Eastern Passage, NS., Brothers Frank,serving overseas, Bernard, Jack and Aubry, and sister Aileen.